When we choose to ride our horse down the center line in a dressage test, we accept that we will be judged primarily on how our horse accepts our aids, how he moves in all three gaits, and how he bends and turns through the arena between the required markers. If the horse can do all of these things well, there is a good chance he will be ‘on the bit’, that is, working comfortably into a contact. From here he can be trained to become more athletic by the processes of developing engagement and impulsion. So, how do you ride your horse ‘on the bit’? It is important that the rider takes time to think about how they can bring the Scales of Training into their own routine training sessions when they are practicing on their horse for their tests. 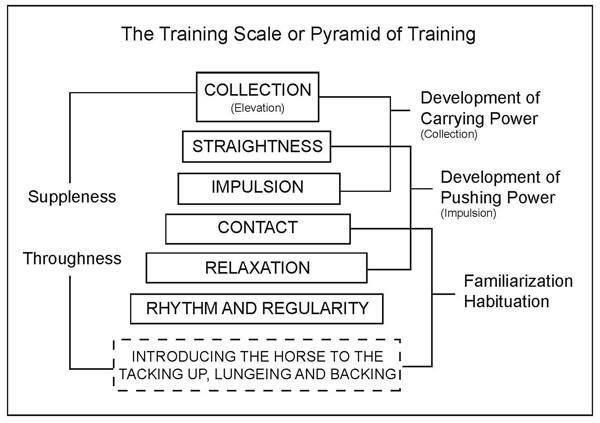 The training scales clearly outline how we wish to ride; in a rhythm, with suppleness and relaxation, working into an elastic contact, with impulsion, straight and collected (figure 1). Figure 1: Flowchart detailing the Scales of Training. Note how the scales integrate and benefit each other. When we are training the horse in the familiarization period to go on the bit, or retraining a horse, it is the first three scales that are important to us. They are inseparable; not one scale may be omitted if the fundamental acceptance of the aids and thoroughness is to be achieved. When the horse has learned to accept the aids and be on the bit and through, the next phase of developing the pushing power and engagement may begin. And from there, the horse learns to develop the carrying power in the final phase. Here’s a rough description of the first three phases along with links to other articles that offer more in-depth information about that particular scale of training. Walk – 4 regular hoof beats in a marching time. 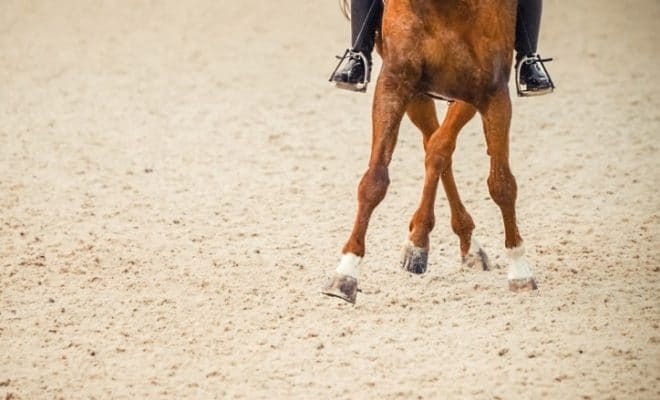 Trot – 2 hoof beats and the legs move in diagonal pairs plus a moment of suspension when all legs are off the ground. Canter – 3 hoof beats and only one diagonal pair move together, and there is a moment of suspension. The rhythm should always be in an appropriate tempo, i.e. the correct speed. It is the job of the rider to facilitate and regulate the tempo. Then the rider can assist the horse to maintain a useful, workable balance. The horse can activate the large muscle groups, i.e. 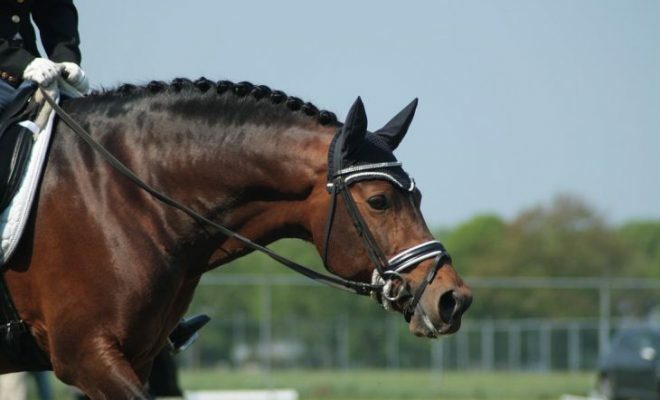 those of the hindquarters, abdomen, shoulders and neck to facilitate the rhythm and tempo, but he must be free from resistance or ‘blocking’ against the rider’s aids. Additionally, the horse should be able to move easily through the paces and in both directions. 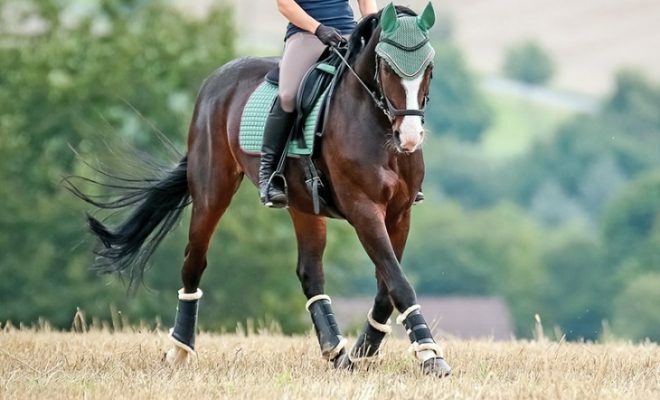 By the application of even, elastic rein aids combined with breathable aids from the legs, driving and/or holding aids from the seat and core, the rider can influence the hind legs to step under and through. This activates the abdominal/pectoral muscles in the horse and aids in the raising of the back and shoulders which prevents the horse from falling onto the forehand. 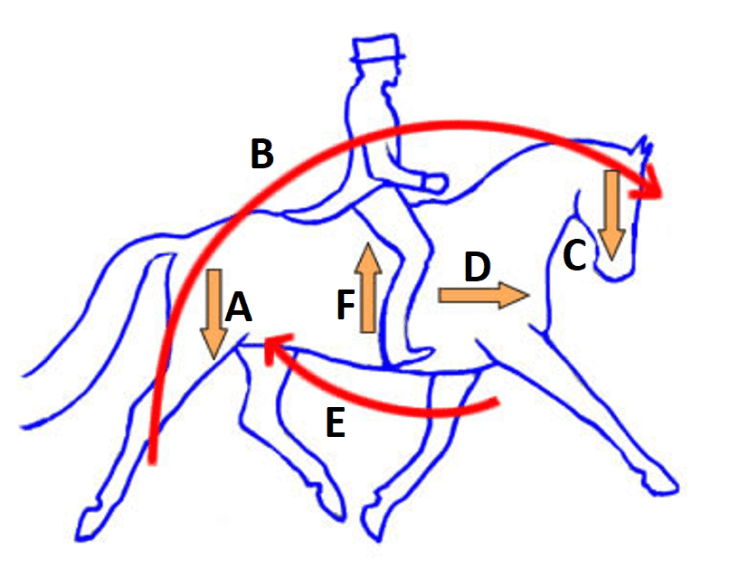 Figure 2: Illustration of how the rider’s aids are responsible for influencing and building a way of going that enables the horse to go ‘on the bit’. Arrow A is created by the engagement of hind legs and the lowering of the hindquarters. Arrow D indicates the forwards impulsion created by the seat, the engagement of hind legs, and the freedom of the forehand. Arrow F is created by the activation of horse’s abdominal muscles to help the raising of the back and shoulders. This is aided by the legs and seat of the rider. All the above arrows work simultaneously and benefit each other. They are the combination of the scales of training working together. Firstly, keep it simple for both horse and rider! 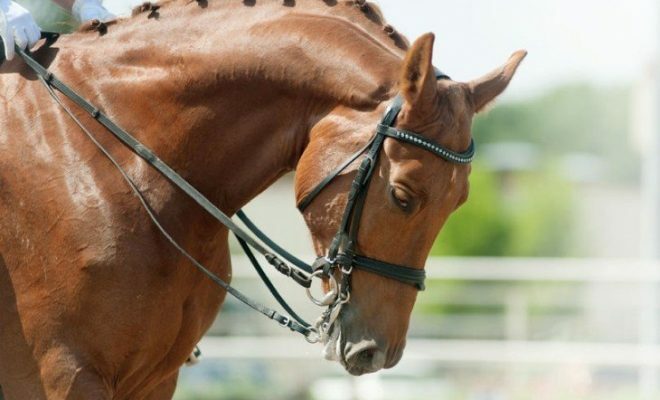 The most up-to-date dressage tests are formulated from ideal individual training exercises that are consecutively linked together to form a test. Whichever level you are training at, break down the movements within those tests and use them in your training at home whilst thinking about the diagram above. Start by riding easy transitions: walk to trot; trot to walk; halt to walk; trot to canter. When these are fluently between the forward aids of the legs and seat, into the waiting aids of the hands and reins, you can introduce changes of tempo (speed) in the trot and canter. 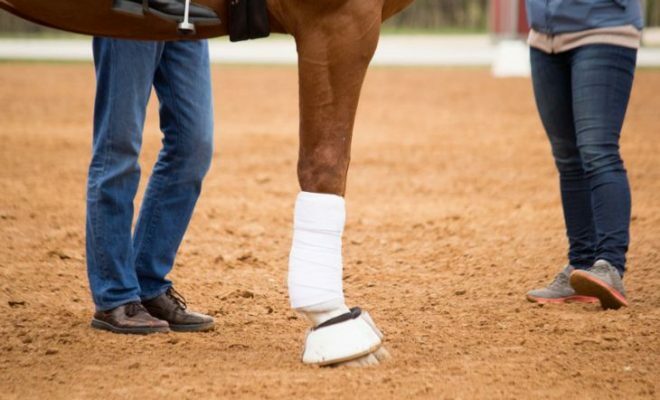 Build these transitions and tempo changes onto different lines and diameters to increase the amount of simultaneous lateral suppleness and bending the horse must do. This will increase his engagement and his ability to bear more of the forwards weight of momentum on his hindquarters, and therefore lighten his forehand (figure 2). Riding your horse ‘on the bit’ requires many hours of work and practice. Use the Scales of Training, and the exercises outlined above, to teach your horse to work on the bit.